Dr. Anil D. Galle has obtained his MBBS from the Karnataka Institute of Medical Sciences in Hubli, Karnataka, India. He later obtained his MD (Internal Medicine) from All India Institute of Medical Sciences (AIIMS), New Delhi, India. After obtaining his MD, Dr. Anil obtained his DM (Medical Gastroenterology) from the Post Graduate Institute of Medical Education and Research (PGIMER), Chandigarh, India. Dr. Anil has over 10 years of experience. He started his professional journey as a Senior Resident at the All India Institute of Medical Sciences, India in the Internal Medicine department. He spent 3 years there before moving to Sagar Hospitals, Bangalore, India as a Junior Consultant in the Internal Medicine department. He spent some time at Sagar Hospital before becoming a Consultant at the Vardhaman Hospitals, Karimanagar, Telangana, India in the department of Medical Gastroenterology. Dr. Anil spent over a year there before joining Narayana Multispecialty Hospitals, HSR Layout, Bangalore, India in the department of Medical Gastroenterology. Dr. Anil has attended many courses, conferences and workshops. He attended the ISGCON 2010, 2011, 2012 and 2013. He has presented posters at ISGCON 2010 and 2011. Dr. Anil has also attended the IBD International conference held at Hyderabad in July 2014. Dr. Anil also has a publication to his name. The publication was on Non-invasive ventilation after extubation in patients with chronic obstructive airways disease. 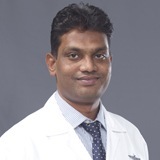 Dr. Anil is fluent in English, Kannada Hindi, Telugu and Marathi.